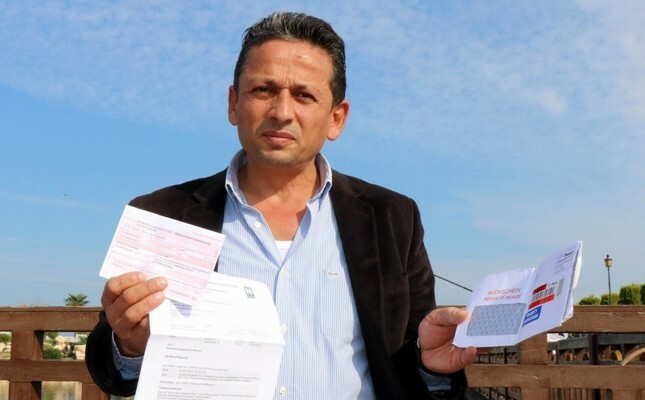 Muharrem Şengül, a resident of the Black Sea province of Samsun, was baffled when he received a 350-euro fine for a traffic rules violation in Austria - without ever having set foot in the country. The 48-year-old Turkish-Georgian dual citizen said that the last time he was abroad was back in 2014. "At first I thought it was a check. I saw the letter in German and I saw the word 350 euros, I thought someone has sent me some money. But when my German-speaking friend read it to me, we found out it was a notice." Şengül said that he has never been to Austria and was now frightened to go there. "The letter says I was doing 122 kph in a 70 kph zone, in a car I do not own." He added that Turkish officials have advised him to pay the fine or face arrest "if I go to any European country." He said that the fine amounted to more than TL 2,000, a considerable sum. "Sometimes we see this kind of news on TV - a man from Ankara was fined in Gaziantep, even though he has never been there. But I think I am the first person to face traffic fines in a country that I have never been to," said Şengül.